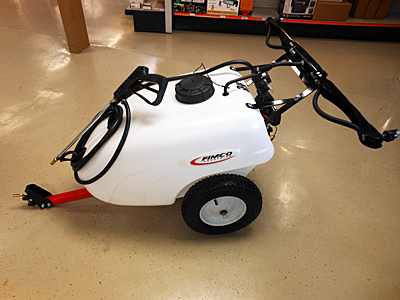 Fimco 25 gallon AFV/UTV sprayer with 7-foot two-nozzle boom. 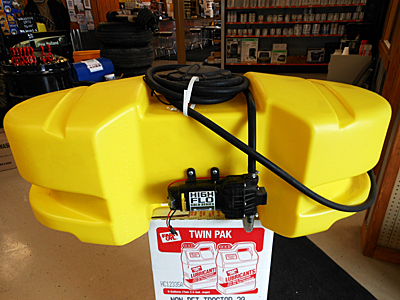 Includes 2.1 GPM pump, 60 PSI with spray wand. 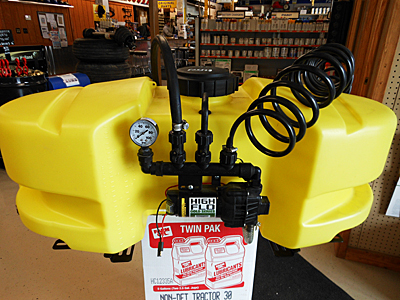 Fimco 25 gallon ATV/UTV sprayer with 2.1 GPM pump, 60 PSI with spray wand. Fimco 30-gallon deluxe trailer sprayer with 2.1 gpm pump, boom covers 80", pistol grip gun with 15-foot hose, gauge/agitation, 4.80 X 8 tires. Set up and ready to go. AgSmart 4.23-gallon backpack sprayer, lever-action piston pump with convertible handle for right- or left-hand use, built-in fold-down handle for easy transport, wide-mouthed tank lid opening for less spillage. Comes with four spray tips, lance clips to side of tank for convenient storage, quick-fitting padded harness, built-in strainers and screens to help prevent clogging, complete spare parts kit. Copyright © 2013, Werner Implement Inc.